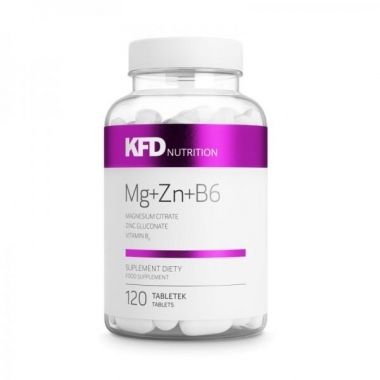 KFD Mg+Zn+B6 is a synergistic complex of three ingredients: magnesium (on the best organic form of citrate), zinc (in form of lactate) and Vitamin B6. Components of the product help to improve metabolism, nervous system, protein synthesis and endocrine system. Product may be used by women and men whose requirements for minerals are increased. - Improved metabolism and muscle, bone and joint functioning. - Helps maintain homeostasis of the body. - Better quality of sleep. INSTRUCTIONS FOR USE: As a dietary supplement, take 3 tablets daily, with plenty of water. For maximum benefits, consume as directed everyday. Ingredients: Magnesium salts of citric acids (magnesium), bulking agent (cellulose), zinc lactate (zinc), anti-caking agents (magnesium salts of fatty acids, silicon dioxide), pyridoxine hydrochloride (vitamin B6).